Handle Without Ever Having To Ask." There’s a good reason why I recommend you implement a referral marketing system, but only after your online acupuncture marketing strategy is in place. There are a lot of practitioners focusing on building their practice from referrals before setting up an effective online lead generation system. I think this is a big mistake and I’ll tell you why. Last year I talked with an acupuncturist who was very frustrated that her referral efforts were fruitless. She couldn’t understand why her patients weren’t referring others. She would talk to them and let them know she was expanding her practice and told them if they knew anyone who could benefit from acupuncture to please give them her number. Still this approach was not working. I told her there’s nothing wrong with this approach as long as she didn’t depend on it as the main source of generating new patients. Because referrals grow organically. They happen naturally when an existing patient mentions your name to a friend, colleague or loved one who is in need of an acupuncturist and tells them how great you are. The problem with Mary is she was expecting her patients to be out there selling her services in a proactive way. We know it doesn’t work that way. I said, Mary (fictitious name,) if you plant a seed today, do you expect to have a tree with low hanging fruits in a week? Of course not, right! Well, the same goes for referrals. They grow organically. No matter how much you hope, wish, shout and pout, they’re going to come as a result of other factors. I’m talking about the mistake many practitioners make by relying on their existing patients to refer new ones on a regular basis, when they should be focusing their efforts on getting a minimum of 3 new patients every week from the internet. 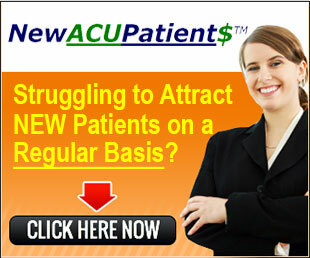 Have you noticed the more new patients you get, the more referrals you also get. Do you know why? Because as you add more patients to your practice, a percentage of them (approx. 1 out of 5) will refer a friend. It doesn’t work the other way around. In other words, if you get a referral, that referral is not going to refer 5 new patients. It’s one referral for every five “new” patients. You can see how the growth becomes exponential as you add more patients. In other words, if you focus on acquiring new patients the referrals will come naturally. The bigger your patient base, the more referrals it will produce. 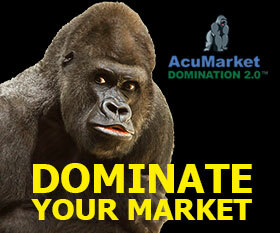 So, focus first on acquiring new patients via the internet and the referrals will follow. 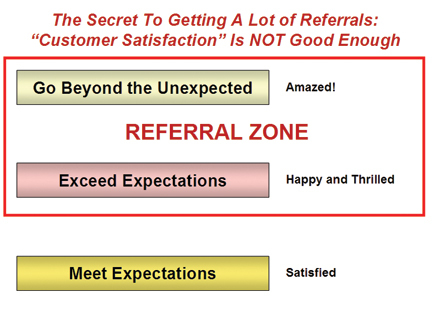 Referrals are great because they’ve already been pre-sold on you. Someone they trust (keyword being “trust”) has already done the selling for you. They know they’re going to get treated right and they are likely to get results. “OK, Frank… All this makes sense, but are you saying there’s absolutely nothing I can do to increase my rate of referrals? Actually, there is something you can do that works like a charm. Let’s go back to the seed example to illustrate the point. You can’t force a seed to sprout before it’s time. But you can nurture it by fertilizing the soil. Watering it every day, and giving it the amount of sunlight it needs to “organically” sprout and grow into a plant and later a tree. You can increase the amount of referrals the same way-- By “nurturing” the relationship with your existing patients. What are you doing on a regular basis to nurture the relationship with your existing patients? Do you send them a birthday card on their birthday? Do you have patient appreciation day once a year and invite your patients over for an evening of food, music, prizes, etc? Do you send them a Thanksgiving card? How about a Happy New Year card? If you send out Christmas cards it doesn’t count. You see everybody and their brother sends out Christmas cards in December. That doesn’t count for standing out in the crowd. Sending out Christmas cards in December has no marketing value whatsoever. As a matter of fact, the ROI (return on investment) from Christmas cards is negative (-) 100%. In business you have to stand out from the crowd through your marketing. If you don’t stand out you become a commodity, and commodities are judged on price alone. Don’t waste your money on Christmas cards. By the way, I don’t have anything against Christmas. I’m a christian and I love Santa Claus, but sending out Christmas cards to your patients in December is a waste of time and money. Send them a Thanksgiving card instead. More on that in a minute. Let’s talk about marketing facts. Why do businesses lose clients? 9% change because they perceive a better “value” (not price) is available elsewhere. That’s a total of 32%. What about the rest? The other 68% leave because they don’t feel wanted or valued. Understanding this is the key to nurturing relationships effectively. Making your patients feel “wanted” and “valued” is how you get referrals without ever having to ask. A good example of this is sending them Thanksgiving cards instead of Christmas cards. In order to accomplish this effectively you need to have a system in place that you set up once and turn it on to run on auto-pilot. The system I’m referring to is called SendOutCards. I haven’t found a better system that sends out cards on auto-pilot at a very affordable price. As far as I’m concerned, this is the best example of a referral system you can set up to send out cards without lifting a finger. Let me clarify that initially you do have to set it up. But like any system, you set it up once and forget about it. Before I go on about the benefits of using SendOutCards as a referral system, I need to disclose to you how the company is run so there is no suspicion on your part about my intentions. SendOutCards is an MLM (Multi-Level Marketing) company and I hate MLM’s. Let me say that again... I freak’n HATE multi-level marketing (network marketing) with purple passion! If you happen to be involved in some kind of MLM or network marketing program and it works for you, fantastic. Keep doing what you’re doing. But when a friend or relative tells me they’re involved with Amway and invite me to a meeting, I run the other way as fast as I can. I can write a whole article about why most MLM’s are legal scams but I won’t because I’ll start foaming at the mouth. I said SendOutCards is a multi-level marketing company, but I need to rephrase that. 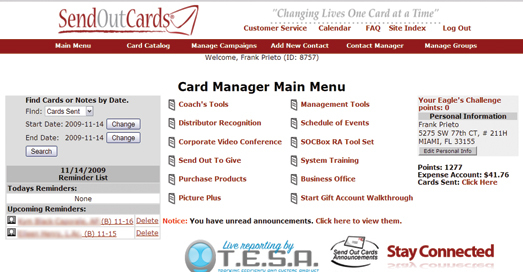 SendOutCards is “run” like a multi-level marketing company. You might ask what the difference is. The difference is that most MLM companies don’t have a unique tangible product that can stand on its own. SendOutCards does have such a product and that’s where the big difference is. Amway may have tangible products like all the household stuff they push, but those are not unique. In other words, I consider an MLM company unique if it can survive without the MLM component, because the product or service they provide has real value. When SendOutCards was started, the founders decided to grow the company using the MLM approach. For example, if you sign up a friend to use the service you get a commission. The commission structure is based on the typical MLM structure where the more people you sign up, the more money you make because you also make commissions from the sign ups of the person you signed up. Like I said, it’s your typical MLM compensation structure. The difference between SendOutCards and other MLM business models is that SendOutCards has a viable, tangible product that doesn’t need MLM to sustain it. Today there a lot of people (or members) who are making a good living with the MLM side of SendOutCards, and there are many others (like me and my clients) who strictly use SendOutCards as a referral marketing system. Because they are structured as an MLM, whenever someone signs up for their entrepreneur package who was referred by you, you make a commission. So there’s my disclosure. It’s just the way SendOutCards is set up. Of course the reason I recommend you sign up for the service is not so I make a commission. As a matter of fact, if you know of a better system to set up your auto-pilot referral marketing system please let me know. I doubt you’ll find one, but if you do I’d love to test drive it. So there you have it. Now that I’ve disclosed my wicked capitalist money making scheme, let’s move on to the good stuff. Let’s talk about the factors that need to be in place in order to “cultivate” more referrals. First, you have to have a large network of people who know you and know what you do. Let me say that again… For referrals to take place you have to have a large network of people who know you AND know what you do. How many times have you got together with your friends and your friend’s friends and a few days later your spouse asks you if you know what Joe or Mary do for a living? Joe or Mary being someone you met at the gathering. This happens quite often. So the reason I’m pointing this out is because it’s so obvious that most people don’t think about it when it comes to spreading the word about what they do for a living. You need to let people know what you do for a living. I’m not saying you should talk shop in a social setting, but whenever you have the opportunity you should let people know what you do. The more people who know what you do, the more referrals you will get. Secondly, you have to have a network of people who like you and trust you. "They don’t care how much you know, until they know how much you care." Thirdly, you have to have a system in place to stay in touch with your patients. The most effective way to stay in touch with your patients and dramatically increase your referrals, is to send them personal, sincere and heartfelt greeting cards on a regular and consistent basis. I talk a lot about marketing systems because without a systematized process to stay in touch with your patients there is no way you can generate referrals in a predictable, consistent and repeatable fashion. There’s just not enough hours in the day to manually put this into practice. You need an automated system, that once set up requires very little time and effort on your part. You must always give them something to talk about! You need to set yourself apart from any and all other “service” experiences that they have encountered. Exceed “far beyond” their expectations starting from the first encounter. It needs to be “systematic. I know you’re going to say this is too difficult. I’m not going to argue with you because I agree it is not easy. However, in business doing the difficult things your competitors can’t do or simply won’t do, puts you in a position to dominate your market. The key to making it work is in tip # 4. It must be systematized. That’s where SendOutCards excels. 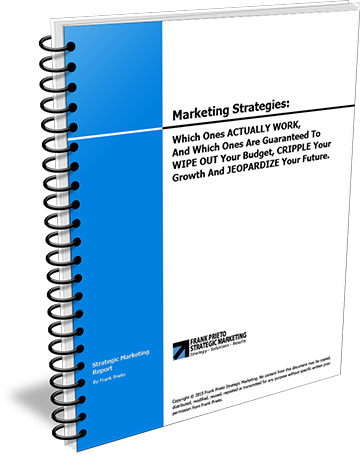 The more complex your marketing system is, the less your competitors will want to copy it. The ironic thing is that it’s not really difficult if you systematize it. That’s the BIG secret. 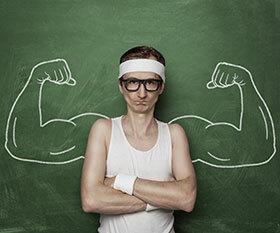 Systematize your marketing and there is no limit to how far you can go. Will it take some effort? Of course it will. Is it worth it? You betcha! "People Make Decisions 3 Different Ways." From existing relationships = 50%. Ask a trusted source for a referral = 35%. In many cases 85% of the purchasing decisions are made without looking at advertising. This does not mean you shouldn’t advertise. On the contrary-- I’m a big proponent of SEO and PPC to generate new patients on a weekly basis to grow the network of people (patients) who like you and trust you. As I mentioned earlier, the bigger your network, the more referrals you’ll get. But if you implement the SendOutCards system you will dramatically increase the number of referrals. Having a referral system that runs on auto-pilot is a sure way to take your practice to the next level. 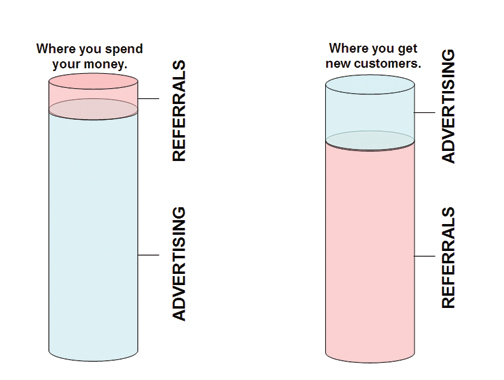 That being said, I still recommend you work on your online marketing first and then implement the referral system. Doing it the other way around is putting the horse in front of the carriage. Remember, the bigger the network the more referrals. If you get your online marketing in order and then implement the referral system you will be unstoppable. 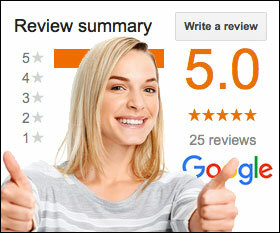 Thank people for giving you a referral. 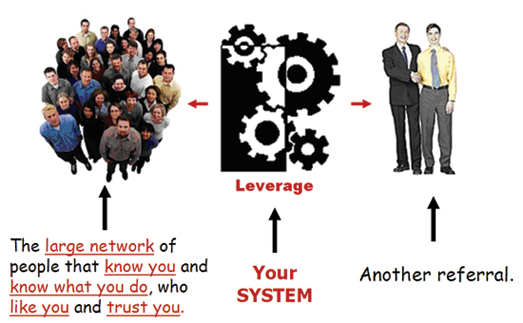 - As you build your network your referrals will automatically grow. Some people find they get more referrals not by asking for them, but by thanking for the referral when they get it. Have Lunch With A Prospective Referral Source Every Month. - Make a list of top 100 most influential people with whom you want to establish or deepen your relationship and send them a “Let’s Do Lunch” card once a month. Remember, the purpose of the lunch is not only to get more referrals, but also to find out about their business so you can also refer out to them. Set up a Birthday Card marketing system. - On average, 20% of the people who get cards will refer at least one person a month. So sending out 1,000 birthday cards a year, should generate 16 new patients per month from referrals. Send them a referral. - The law of reciprocity. Use the N.E.E.R. Formula. - The acronym stands for Naturally Existing Economic Relationships. This is where you tap into not only your patients, but your suppliers as well. Ping Your Network. - Stay in touch on a regular basis. And Send Out 3 Cards At My Expense." As a FREE gift to you, I would like to offer you a FREE Gift Account. This will allow you to send 3 greeting cards at my expense using this incredible referral marketing system. I encourage you to send out a few cards so you can test drive the system. Make sure to send one to yourself so you can get the full experience your patients will have when they get your cards in the US mail. Click on the red button now and you will be taken to my FREE Gift Account and you'll be guided through sending a card with the system. This is a limited time offer because I can only give away so many FREE Gift Accounts. Remember, I'm letting you test drive the system at my expense, so don't procrastinate. If you come back to this page tomorrow this offer may be gone. Avoid disappointment and click the red button now to take advantage of this FREE offer. It's completely risk free and you have nothing to lose, only a flood of referrals to gain. What Else Will This System Do? The $1.01 price includes custom color printing (on both the inside and the outside of the card), stuffing into the envelope, applying a 41 cent stamp, and mailing. 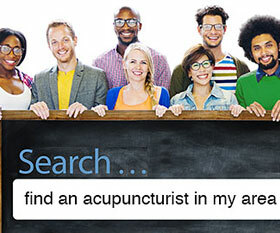 Over 15,000 stock cards to pick from or make your own acupuncture theme card. 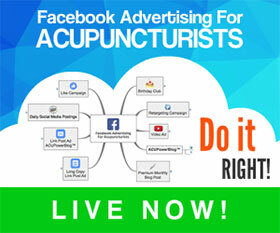 Use this system to increase and build referrals for your acupuncture practice, as well as personally to remember all your friends and family's special occasions. Just program in those birthdays and anniversaries, select a card and it goes out a week before. Never forget important Birthdays or Anniversaries again. Send a custom card from your computer in less than 60 seconds.